The Lobby is a room in the Gloomy Manor in Luigi's Mansion: Dark Moon. This area can be accessed by going into the middle door on the second floor of the Foyer. The Lobby is a small room with the only notable feature being an elevator that takes the player to the Cellar. A picture of a mouse can be pulled off to reveal a safe. The door on the north takes Luigi to the second floor of the Library. 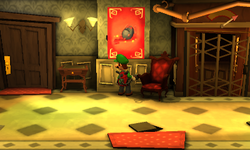 Using the Dark-Light Device on the right wall will reveal a hidden door that will take Luigi to the Balcony. During Quiet Please!, Luigi needs to go through the Lobby to go across the Library. In Sticky Situation, the Lobby might be one of the rooms covered in spider webs. Luigi will also need to go to the Lobby so he can access the grill in the Balcony to burn the webs. In Confront the Source, Luigi will be pixelated into the Lobby so that he can use the elevator to go into the Cellar. In Gradual Infiltration, Luigi will not be able to return to the Cellar because the gate is locked and the key is gone. This page was last edited on February 27, 2019, at 22:32.